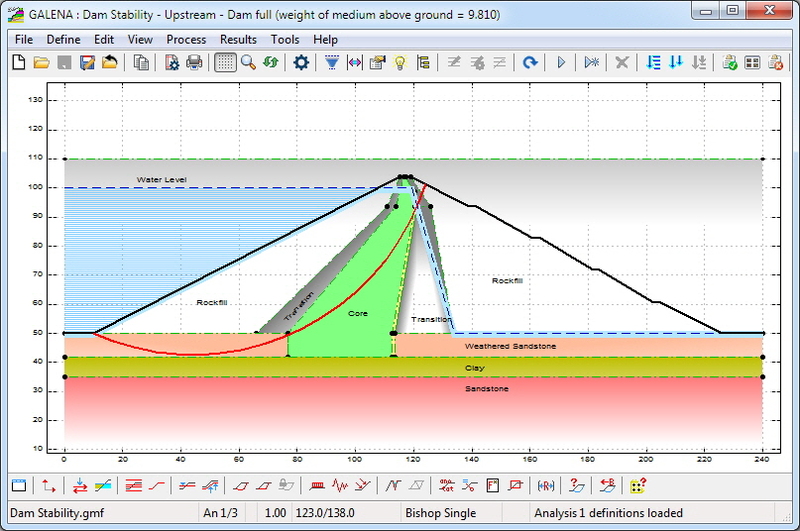 Although GALENA was originally designed for use within mining-related situations many of the unique features introduced and only available within GALENA have been found to be very useful when considering slope stability within broader civil and geotechnical engineering situations. What this means is that the slope surface is entirely independent of the material profiles (profiles define geology or material layers), and can be moved, modified or re-positioned without changing, moving or re-defining the material profiles. The image below shows a complex dam with a clay core. The water conditions are modelled with a phreatic surface (shown as a blue dashed line) that defines the water level behind the dam and within the dam structure, and controls the pore-water pressures within the weathered sandstone and clay layers. In this particular case the downstream face is to be analysed for a ‘dam full’ scenario. It should be noted that with GALENA both the upstream face and downstream face of the dam can be analysed using the one model, simply by defining the failure surface appropriately - there is no need to ‘flip’ the model over to analyse the two faces. 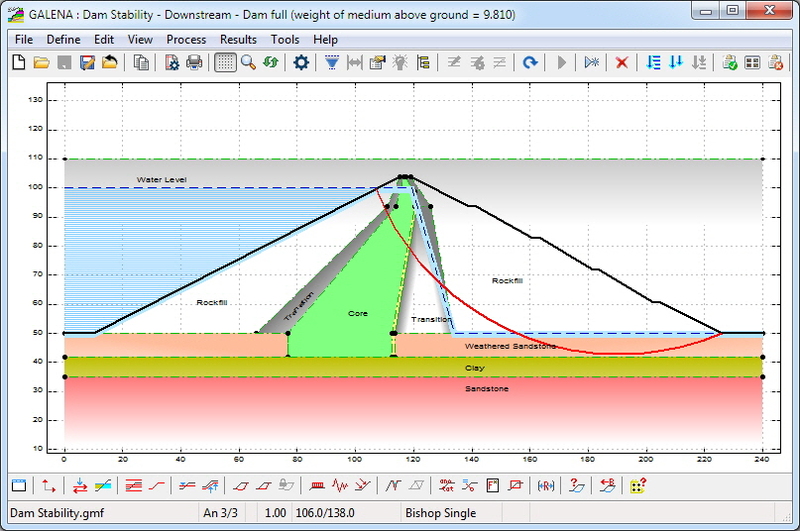 The image below shows the upstream face is to be analysed for a ‘dam full’ scenario. 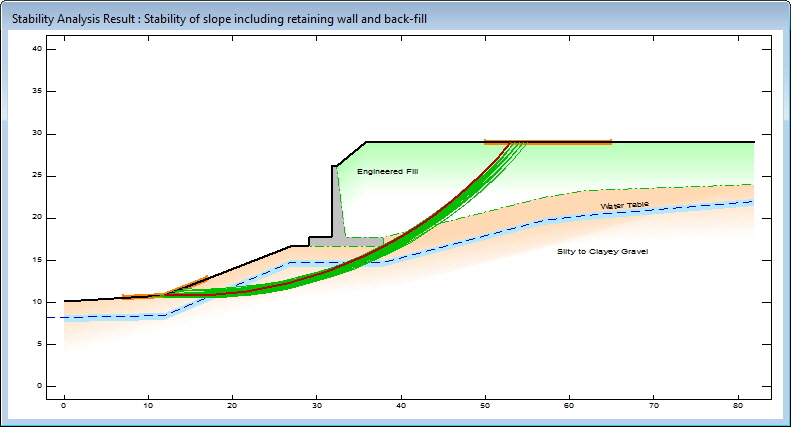 The image below shows a model of a slope where the ground level is to be raised above the existing ‘Silty to Clayey Gravel’ level to provide a level area within the confines of the available ground area... a gravity retaining wall is proposed to be included to achieve the lift in ground level. The material profile defining the ‘Gravel’ is redefined (from a two-point horizontal line above the slope) to follow the slope surface, with an excavated pad for the wall. 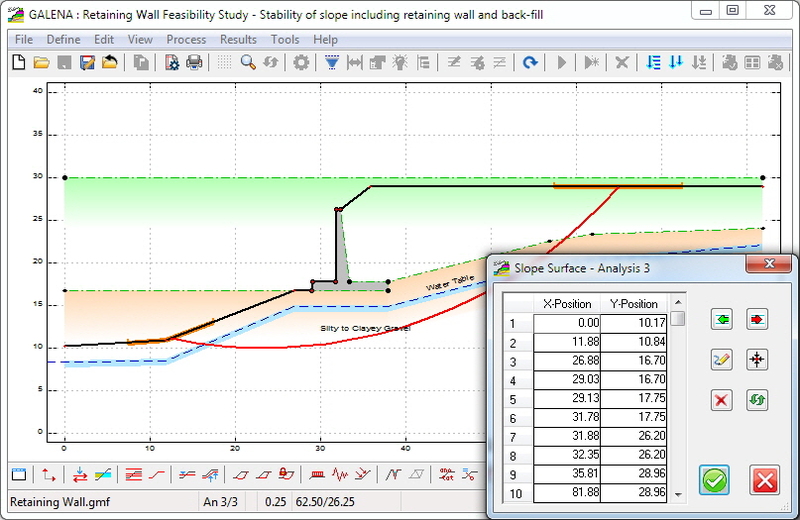 The concrete retaining wall is modelled with a material profile defined as a closed polygon (shown in red in the image), and the wall backfill is defined by the profile above the slope. 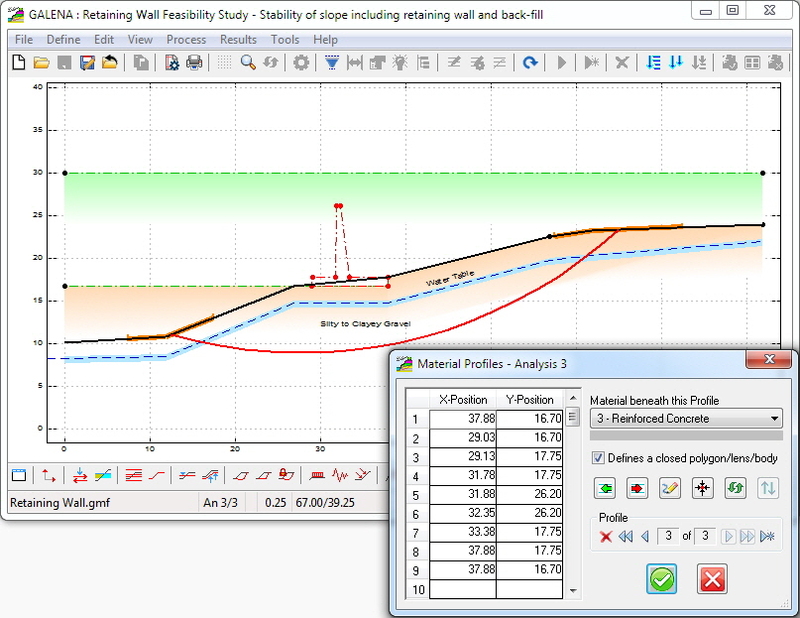 Once definition of the material profiles is complete the slope surface can be redefined to match the outer face of the retaining wall and the upper surface of the wall backfill, together with the failure surface position, as shown in the image below. The analysis result image for this model is shown below - the Factor of Safety was found to be satisfactory, thereby allowing more detailed studies to proceed (e.g. loadings and groundwater positions).